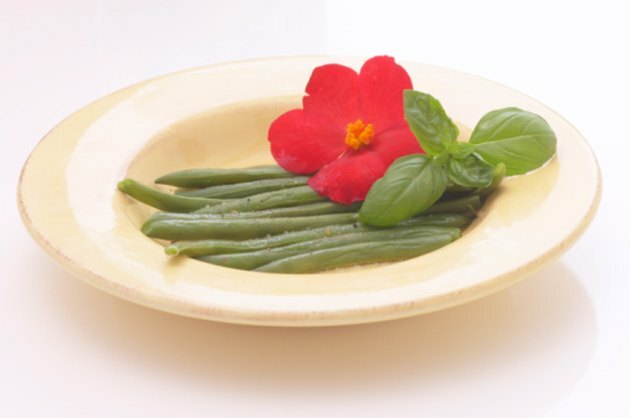 String beans are a quick and nutritious side dish or a colorful and unusual addition to a salad. Farm-fresh produce packs more of a nutritional punch, but keeping frozen vegetables around ensures a healthy meal when there’s no time to shop. Cooking frozen vegetables can be a little tricky. They need to be cooked through to be edible, but they shouldn't be overcooked, which robs them of nutrients and can result in a mushy, unpleasant texture. Boiling frozen string beans is a good method, as long as you pay attention to the timing. Put just enough water in a pot to cover the bottom. Don’t fill the pot, because the intent is to steam the string beans in the boiling water, not to boil them fully immersed. Bring the water to a rolling boil. This is important because the higher the water temperature, the faster the string beans will cook, and the sooner you can get them out of the water. Put as many string beans as you want to cook into a colander and run cold water over them. This won’t thaw them completely, but it will help. Drain the string beans well and slide them carefully into the pot of boiling water. Lift and rearrange them with a wooden spoon, but be careful not to mash them. Let the string beans cook for no more than two to three minutes, moving them constantly. Put them back in the colander to drain. Their combined heat will help them finish cooking. Squeeze fresh lemon juice over cooked string beans to bring out their natural flavor. Never fully immerse vegetables in boiling water and cook them for more than a few minutes, as doing so leaches out their nutrients. What Are the Benefits of String Beans?